Farming the mangrove crab (Scylla serrata Forskall) has become popular in Palau due to its high market demand and lucrative price. Hatchery techniques have been successfully established through a mangrove crab seed production project funded by CTSA in recent years. However, production of juvenile crabs is insufficient to support the needs of the farmers. This is due, in large part, to low survival during the nursery phase of production, which is mostly a result of cannibalism. Cannibalism is likely caused by high stocking density, absence of shelter, elevated temperatures, or artificial diets. The recently completed one-year project “Improving nursery and grow-out culture of mangrove crab by minimizing cannibalism and developing feed supplements” aimed to address these issues. The project was a joint effort between the Oceanic Institute (OI) of Hawaii Pacific University and the Palau Community College (PCC). The first objective of the project was to test the effects of different types of shelters on survival rates to market size for mangrove crab juveniles in grow-out facilities. Nursery rearing trials were conducted to evaluate the effect of using different shelter types and stocking densities on the growth and survival rate of mangrove crab juveniles using 15 units of 1ft x 2ft rectangular plastic containers for three weeks. Four different types of shelters including: sand; sand + oyster shells; sand + spiral screens; and sand + black nettings; and a control (no substrate) in three replicate tanks were tested for 3 consecutive weeks. 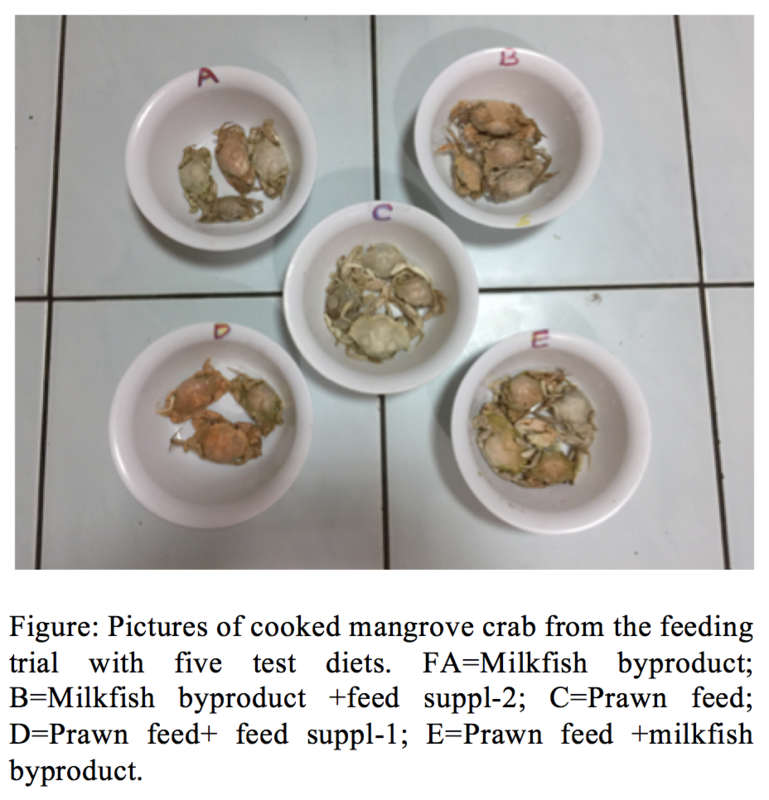 Results of this experiment revealed that the survival rate of mangrove crablets in all tanks decreased exponentially in each consecutive week of rearing due to cannibalism. No significant difference was observed on the survival rate of mangrove crablets in tanks without substrate and sand, while those that were reared in tanks with sand + oyster shells, sand + spiral screens, and black netting had a significantly better survival rate than the former. After trying several different substrates and types of shelter, the PCC team developed a sand + black netting shelter technique that increased mangrove crab survival. The third and final objective of the project was to improve culture performance of juvenile mangrove crabs by combining imported shrimp feed with nutrient and functional feed supplements. Researchers first procured two important feed additives: mulberry leaf extract and astaxanthin. 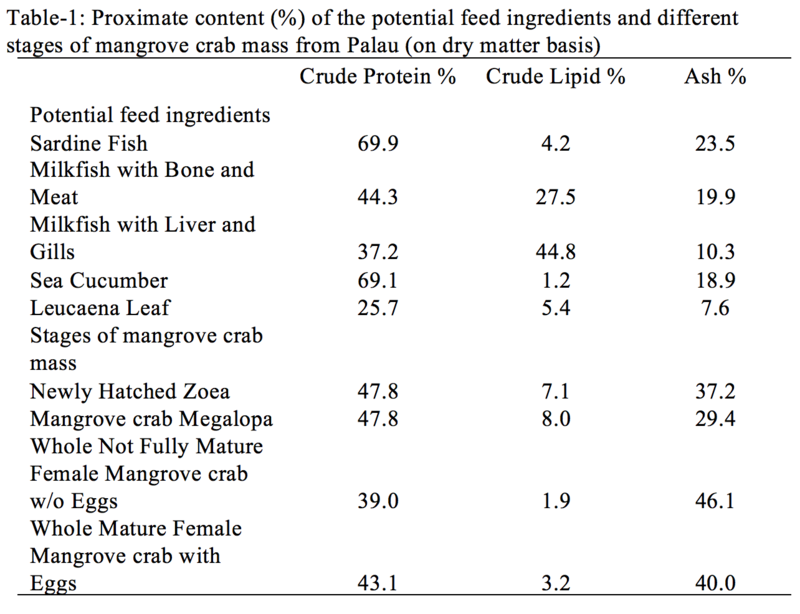 Local feeds in Palau are deficient of astaxanthin, as evident in the tank grown mangrove crabs, which have pale blue colored shells and when cooked, become orange in appearance. The lack of astaxanthin in diets could cause mangrove crabs to poorly deal with environmental stressors, generating commonly seen aggressive behavior that leads to increased mortality and reduced growth rate. Therefore, the astaxanthin feed supplement was included in diets for the feeding trial. Mulberry leaf extract has been reported to decrease cannibalism in mangrove crab, and was used in combination with astaxanthin in an attempt to reduce aggressive and cannibalistic behavior of mangrove crab. Prawn feed and milkfish byproducts are typically used as mangrove crab feed in Palau’s aquaculture setups. Therefore, researchers prepared two feed supplements for them for the feeding trial at Palau Community college. Feed-supplement-1 and feed supplement were prepared respectively for prawn feed and milkfish byproduct according to their lack of vitamins and minerals, and feed additives including mulberry and astaxanthin were included for minimizing cannibalism and pigmentation purposes. A series of feeding trials was conducted. Five feeds were prepared for the feeding trial: prawn feed, prawn feed +feed supplement-1, milkfish byproduct, milkfish byproduct + feed supplement-2, and prawn feed+ milkfish byproduct. Each diet was set up with three repetitive tanks, and each tank was stocked with 15 juvenile mangrove crab. The test tanks were outfitted with black net shelter protection. However, each tank had only one surviving mangrove crab after the two month feeding trial. It was observed that crabs fought each other until the last survivor. This suggests that the net shelter could not prevent their fighting and the mulberry feed additive could not stop their cannibalism. Therefore, a second feeding test was conducted with 20 tanks; each tank was stocked with only one mangrove crab and each diet had four repetitive tanks. Eight weeks of growth results are showed in Table-2. It can be seen that two feed supplements significantly increased the growth rates. The combination of half milkfish byproduct and half prawn feed achieved the best growth rate. This has led researchers to encourage farmers to feed crabs a mixture of fresh milkfish byproduct and commercial prawn feed to obtain higher growth rates and higher profits. Detailed results from this project including additional tables and figures will be included in the forthcoming CTSA 2018 Annual Accomplishment report. If you would like to obtain the information prior to December, please contact CTSA or the project PI Dr. Zhi Ju.